There are certain things in sewing that you just hate doing. 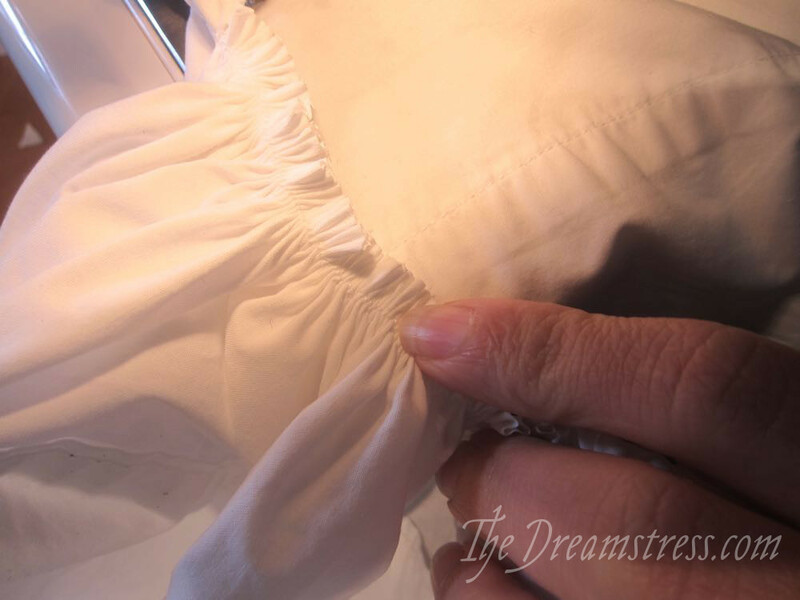 Some people hate setting zips (if you do, use the zip method in this tutorial and they will come out perfect every time), some people hate setting sleeves, and some people hate gathering. I was one of the latter. Then I figured out how to do cord gathering, and the skies parted, and angels sang. Cord gathering is AMAZING. It allows you to quickly and easily gather in huge amounts of fabric, perfectly and evenly, with no need to sew multiple lines of thread, no need to start and stop your stitching every two feet or so, so the threads don’t get too long, and no chance of broken threads as you gather. Oh, and the gathers look much, much better than standard gathers. Have I mentioned that cord gathering is amazing? 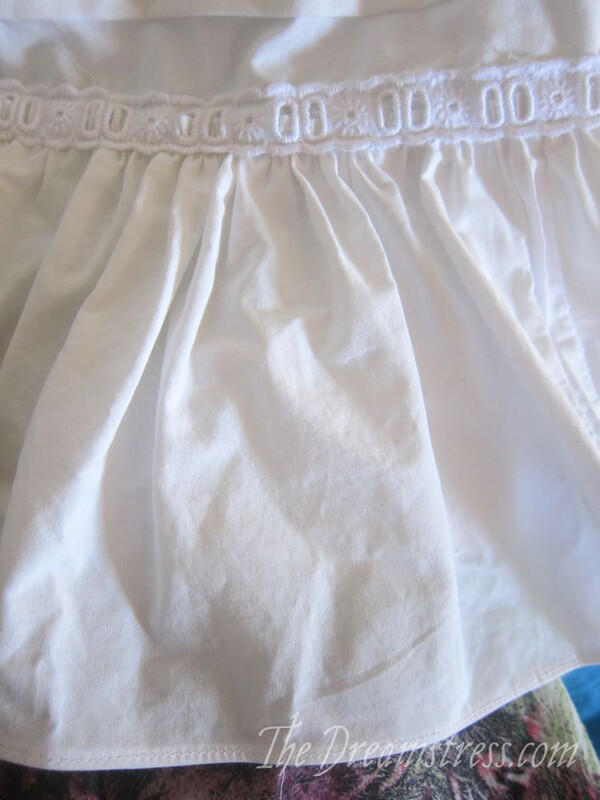 So, the next time you need to gather in a huge skirt, sew acres and acres of ruffles, or just do a wee bit of gathering for a little girls frock, here is the 100% effective, 100% painless way to do it. The fabric you want to gather. A thin, strong cord for gathering, such as heavy-duty thread, dental floss, or fishing line. Thread, scissors, a sewing machine, etc. I like to use heavy-duty thread for my gathering, because I prefer the way it feels as I work with it. I also like that it’s (or at least can be) a natural fibre, so there are no synthetics left in my garments if I choose to leave it in. Unlike finishing line, heavy thread will have minimal effect on the overall fall of your garment if left in. Many people prefer to use fishing line because it’s much harder to catch in your stitching, and easier to pull out when you are finished. I don’t like to use it because I hate the way it feels running through my hands (it gives me the same heebie-jeebies as fingernails on a chalkboard), but that’s a weird personal things. There is also the small possibility that if you do hit the fishing line as you stitch, you’ll cut right though it, and have to start over, whereas you can unpick and rescue your gathers if you stitch through the thread. Dental floss works well, and is useful because almost everyone has some around the house (hopefully!). It pulls out easily, doesn’t affect the fall of the finished garment, but can be caught in the stitching. All of the types of cord have advantages and disadvantages, experiment and pick the one you like working with best. 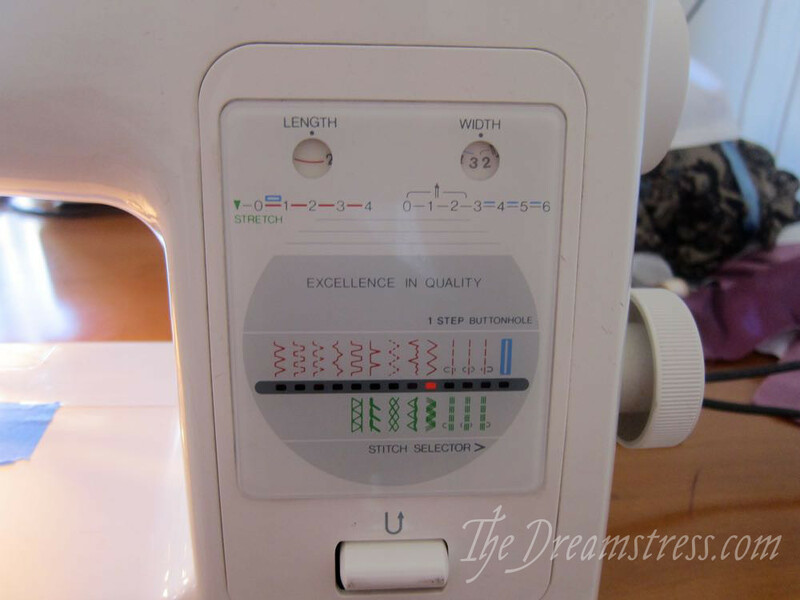 Set your sewing machine to a fairly tight, medium height zig-zag stitch. 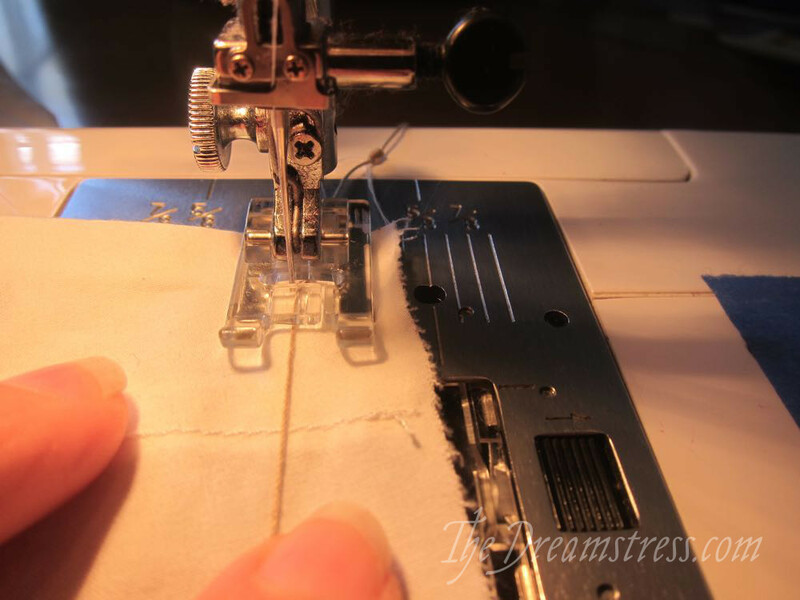 On most sewing machines your stitch length should be between 1.5-2.2, and your stitch width (height) should be between 1.5-3. 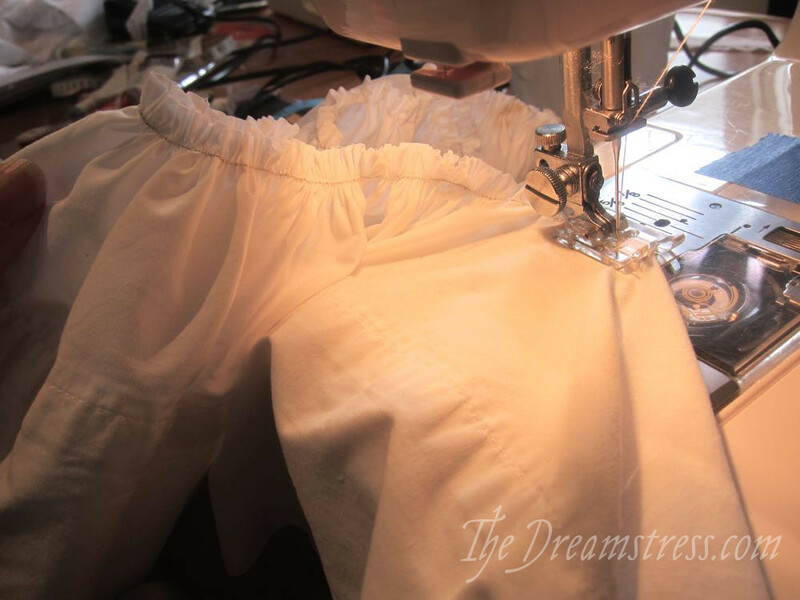 If you are gathering in a large amount of fabric (say, a huge skirt, or a ruffle for a petticoat), divide your fabric into at least four sections, and mark the start/end point of each section. Then, measure out a length of cord as long as you want the finished gathered length of fabric to be, divide your cord into four sections, and mark the start/end points of each section on the cord. Pilot Frixion pens work great for marking the cord and fabric. The marks will help you to gather the fabric to the correct length as you sew. 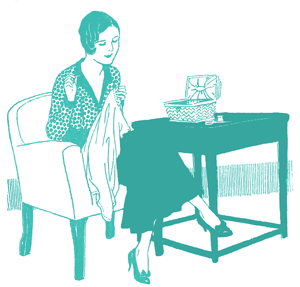 You’re going to be zig-zag stitching over the cord, just within the seam allowance of the fabric. 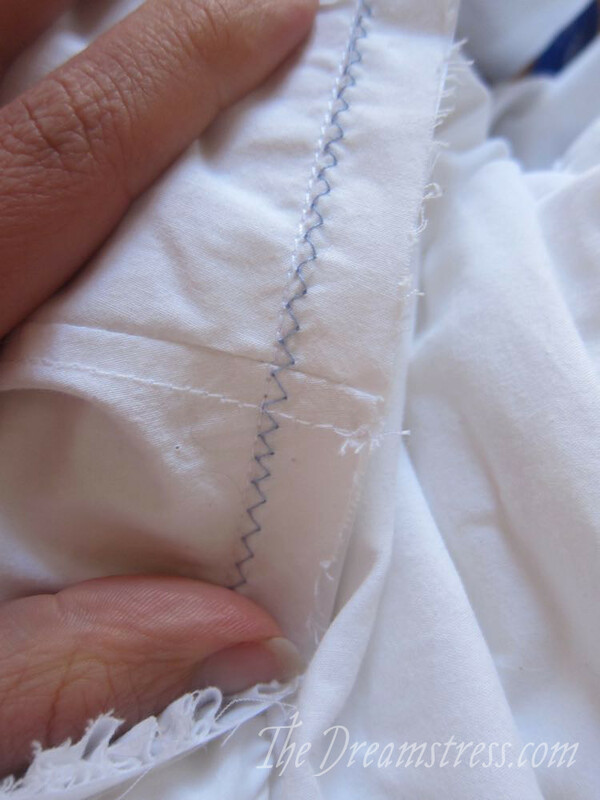 Place the edge of your fabric at the 1cm / 1/2″ seam line (assuming your garment to sew has a standard 1.5cm / 5/8″ seam allowance – you want the gathering to be in the seam allowance), and place the cord so it runs directly between the inner and outer edges of the zig-zag stitch. Start stitching, backstitching at the beginning, and making sure that your zig-zag stitches fall on either side of the cord, enclosing the cord in stitching. 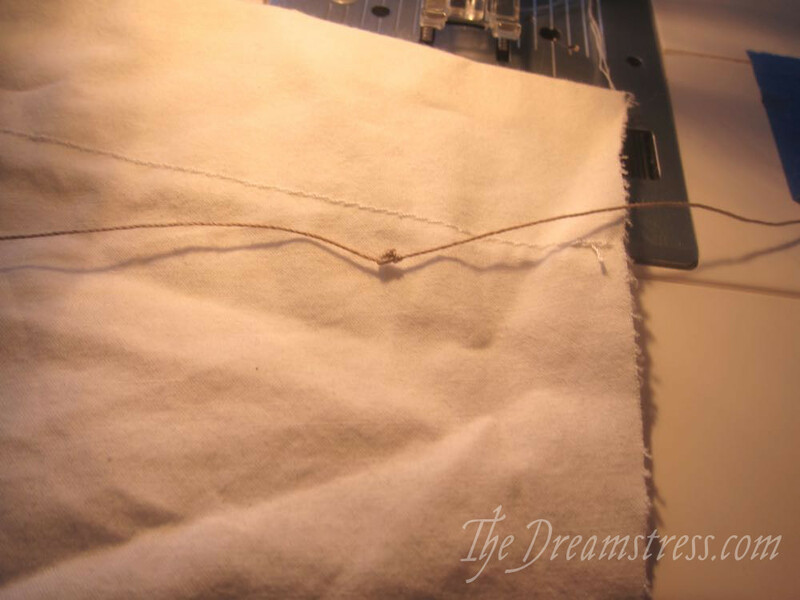 Make sure that you do NOT sew through the cord at any point, as you won’t be able to gather along it if you do. As you sew, pull on the cord from the front, to gather in the fabric over the cord as it comes out from behind your foot. Use the marks on your cord and fabric to make sure you are gathering the correct amount for each section. See how neat and crisp they are! 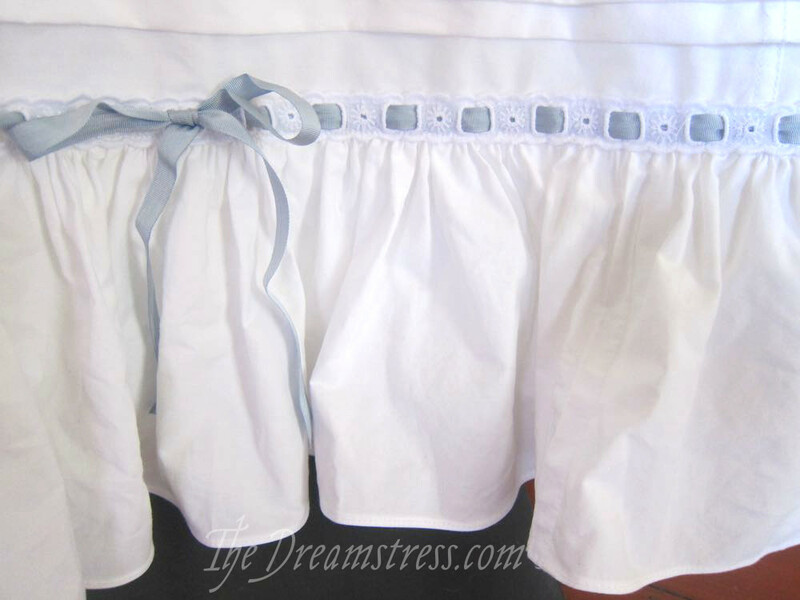 Now all you have to do is attach them to your skirt, waistband, dress etc! When you attach them, be sure to sew just below the zig-zag stitching, so it doesn’t show through on the right side of the garment. After you have sewn your gathered fabric on to a waistband etc, you can pull out the cord you used for gathering. If you don’t want to have raw edges that need covering, use the fold method of cord gathering (see below for more info). The zig-zag technique works for almost all applications, and almost all fabrics. 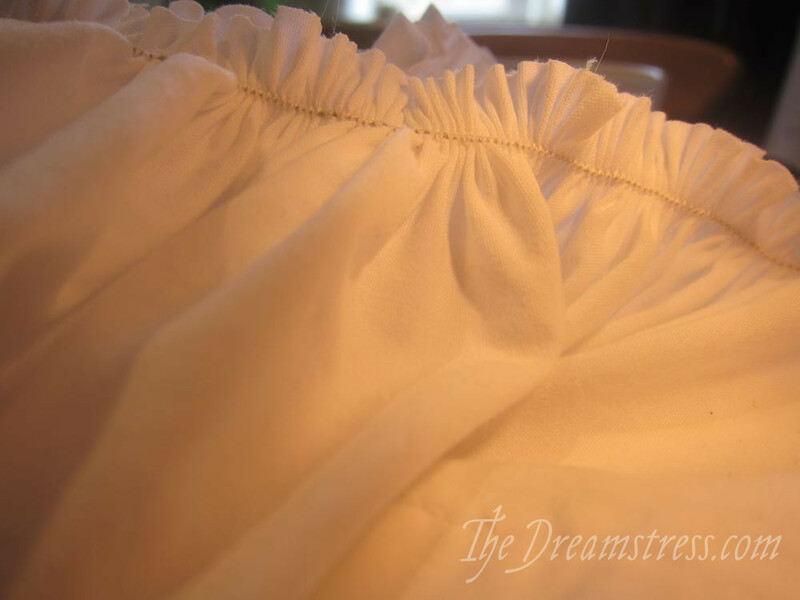 It is not, to the best of my knowledge, a historically accurate technique (zig-zag stitching was not available on most machines until the 1950s), but it’s quick, easy, painless, and makes beautiful ruffles. 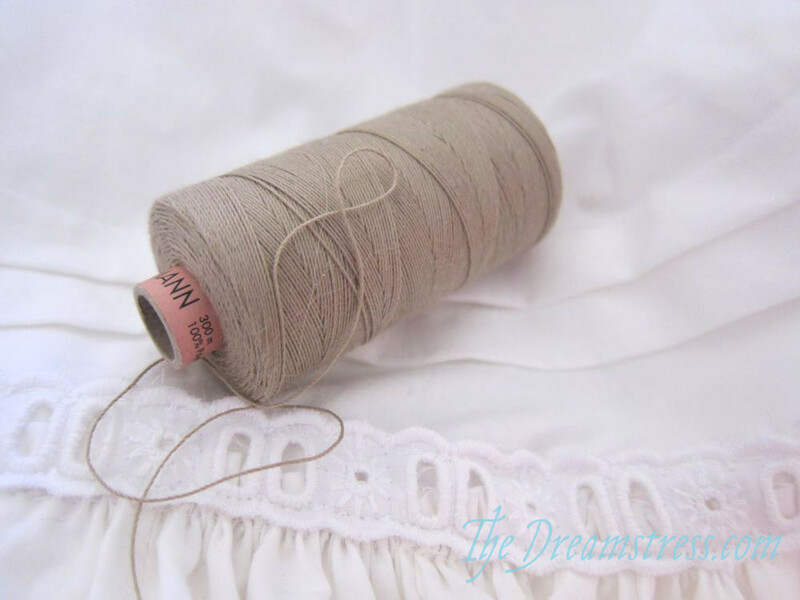 You can also do cord gathering by folding your fabric over a cord, stitching close to the cord using a zipper foot, and then gathering the fabric along the cord like a drawstring. 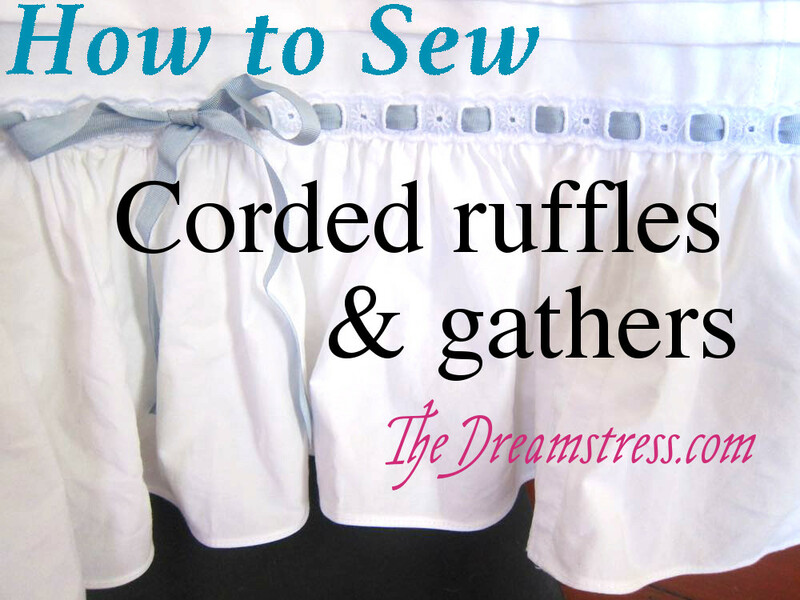 I’ve described that method of cord gathering in much greater detail in this tutorial. 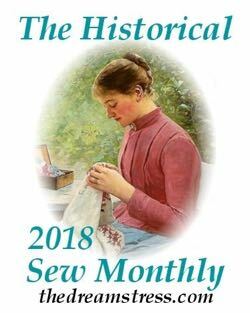 I have seen the second method of cord gathering on at least one garment from the early 1900s, so it is period accurate to that era (though uncommon). It does not, however, work well on heavier fabrics, nor does it work for any type of gathering where you don’t have an edge to fold over. Thanks for this! I’ve never thought of doing gathers this way, but it definitely looks promising! Great tutorial, as always! I’ve found that a pintuck presser foot helps keeping the cord in position. Thank you! Yeah, pintucker presser feet are awesome, and very helpful for this, but most sewists don’t have one, and not all machines will let you use a zig-zag stitch with the foot, so I opted for using tools that most sewers would already have around, as it’s totally possible to do it without a pintuck foot. Yes, you’re right. The pintuck foot came as a standard with my inherited 60’s Husqvarna/Viking according to the manual – but now that I think about it, maybe pintuck, darning, and hemming feet aren’t standard equipment anymore… 😉 I’ve found them all useful, though. This is a way neato way to do that! And way less bulky than channel gathering. And it makes me less sorry that the Lucznik’s gathering foot doesn’t fit on Ema! I learned this technique when I was doing my work practice at local Opera house long time ago. It is so handy and I love it. I usually use heavy duty cotton thread which is called “fish thread”, a direct translation from Finnish. I think the name comes from the time when they used it to make fishing nets but these days it’s mainly used for weaving and crochet. It’s so sturdy you can’t really break it by pulling, that’s why it works so well for this technique. And it’s easy to get here too. This is awesome! I have never seen gathers sewn this way. I will be giving this a try because I really hate making gathers. I do love the way they look. Your method really likes simple. Like something could do. I wish I had know about this back in the day! I love this technique, thank you! Anyone with a Bernina can also use the number 6 foot, which has a hole through it for the cord so it is super easy, and it used to be a foot that came with the machine. Always hated gathering, tried this today, immensely helpful, thank you! I was taught to gather ruffles like this in home-ec, back in the day. Like you said about, I know this is not a standard foot, but do you think you could achieve the same thing with a cording foot? I bet we could and this would prevent accidentally hitting the thread/floss/line. I’ve done this with my regular zig zag foot but I think I’ll try it with my cording foot to see if it improves my accuracy. I have a wonderful old Pfaff Sewing Machine. Thank you so, SO much from Belgium!! I put off making a certain pattern because I dreaded doing all the gathering. Now I can dive in and do it, thanks to your brilliant method. THANK YOU! Did I hear a “some people hate setting sleeves” in there? Have you got any magic for the sleeve people? 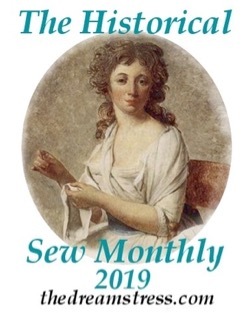 My only suggestion for sleeves is to sew three lines of ease stitching, vary your ease stitching to the weight of the fabric (tighter for lighter weight) pin very carefully, and machine baste first. 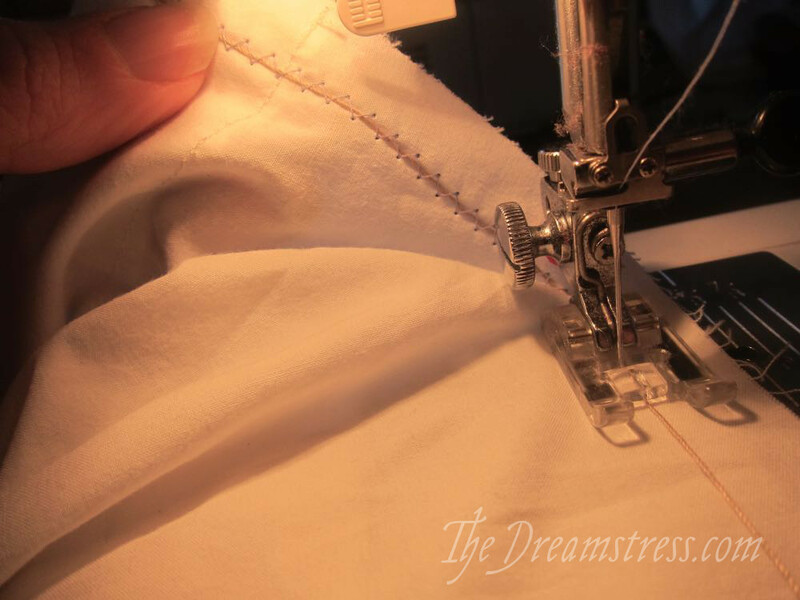 Your stitches should fall between the 2nd & 3rd line of ease stitching. Also, pay attention to the alterations you often make for yourself: I have slightly forward-tilted shoulders, so I move the shoulder-point of 90% of sleeves forward 1.5cm, and that makes them sit better. 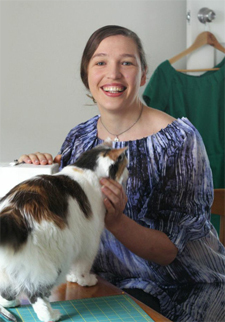 I also sew sleeves with the sleeve right side out, inserted into the garment which is wrong side out, and I usually sew with the garment facing up, and the sleeve going around the free-arm of the machine, so the feed-dogs can help ease in any extra fullness. Thank you for this. I used to laboriously measure and pin to get accurate gathers but this works every time. However, the li to the folding method tutorial does not work. I got a page full of warnings and messages that the server did not support the link. Please can you put the tutorial somewhere else? I for one would find it really useful. You’re so welcome! Glad it helps!